28/10/2 - Acquisitions - Metz, Musée de la Cour d’Or - With the help of the FRAM Lorraine, the Musée de la Cour d’Or has purchased two 17th century paintings by Metz artists from the Galerie Jean-François Heim in Paris. 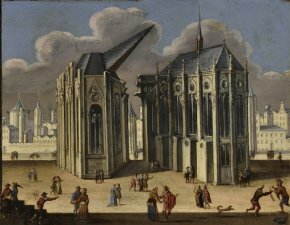 The first, painted on slate, is signed by Didier Barra and represents an imaginary (or fantastic) view of a Gothic church (ill. 1). This painter was long mistaken for François de Nomé, also a native of Metz who likewise worked in Italy, under the generic name of Monsu Desiderio ("Monsieur Didier"). Today this confusion is hard to believe as their works are generally very different. One, François de Nomé, is easily recognizable with his extremely characteristic fantastic compositions, small mannerist figures and strange architectural structures. Didier Barra, on the other hand, painted more topographical scenes although he also produced imaginary urban views like the one now purchased by the museum. This painting is particularly strange : the background shows a city, while two Gothic church choirs appear in the foreground, unless it is the same church sliced in half (but where is the entrance then ?). Everything in the scene appears to be a product of the artist’s fantasy including the small groups of figures going about their various tasks, none of which is really clear in fact (what are the two men on the right, one of which is dressed as a fool, doing ?). 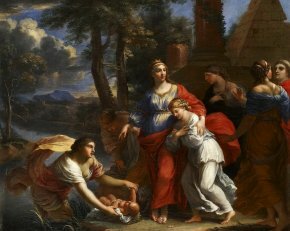 Thus, while Didier Barra’s composition in this work in a way recalls François de Nomé’s fantastic scenes, the style and manner in which the subject is treated do not at all resemble the latter’s. The painting is in fact signed, a rare occurrence. This is the first work by this artist to join the museum collections, while three by François de Nomé have been acquired since 1997, the last in 2007 (see news item of 7/11/07). The second painting, representing Moses Saved from the Waters (ill. 2) is signed by Charles Poerson. 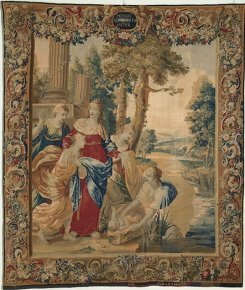 This work by a student of Vouet is unpublished and shows a composition similar to a tapestry from the Story of Moses series of which there are two known replicas (at the Kunsthistorisches Museum in Vienna and the Virginia Museum of Fine Arts in Richmond - ill. 3). There are however several disparities : first off, the two women to the right of the composition do not appear in the tapestry which is higher in format, as opposed to the painting which is horizontal ; secondly, there are many differences in the details of the figures and the landscape. This series is made up of eight tapestries of different sizes probably woven five times, and for which there are about twenty known pieces. The name of the artist of the cartoons had been lost and the identification of Charles Poerson was made possible thanks to a painting found in a private collection representing The Striking of the Rock, attributed to the painter. The resurfacing of this Moses Saved from the Waters, signed by the artist, now confirms this attribution. While we see here the influence of Vouet, it remains rather slight, as the work is closer in style to François Perrier or even Pietro da Cortona. The Musée de la Cour d’Or which had staged a Charles Poerson retrospective in 1997, only held one of his paintings until now, The Poisoning of Camma and Synorix in Diana’s Temple.